Dalradian Resources Inc. is a gold exploration and development company that is focused on advancing its high-grade Curraghinalt Gold Project located in Northern Ireland, United Kingdom. The company is completing a work program in support of a planning (permitting) application for construction of an operating mine at Curraghinalt. Dalradian has worked hard to minimize the environmental impact of its activities and has adopted a code of business conduct and ethics that promotes integrity, transparency and accountability. 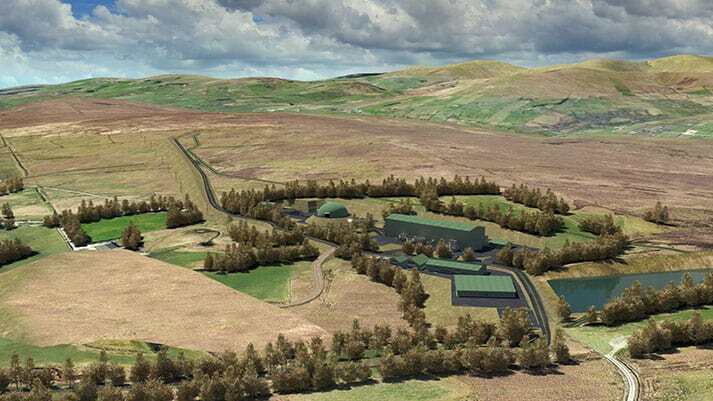 With our help, Dalradian was looking to create a 3D mining video to further the trust and support of the local community and to alleviate concerns regarding potential visual and environmental impacts to the countryside. Dalradian enlisted ImageMaker’s help in producing a 3D visualization showcasing their proposed mining facilities, fully realized in a high-end 3D Animation, and to illustrate the progression of its mining operations over the life of mine. Using their latest technical drawings, we created the mine site in its entirety and placed it onto digital elevation maps of the surrounding area to accurately demonstrate the reduced visual impact from various sight lines and locations achieved through the company’s engineering plans. The 3D presentation brought clarity and transparency to the mining project and was well received by both management and the community. ImageMaker is a strong believer that with today’s global emphasis on corporate responsibility and environmental stewardship, honesty and transparency is paramount in acquiring the necessary social licence to operate your business. 3D Animation is an invaluable tool that can effectively communicate your company’s long term vision to local communities and stakeholders. Let us help you connect with your audience by creating your very own 3D Mining Video for your project. Contact us today! View Dalradian’s full 3D Animation Video here. Check out our 3D Mining Video Portfolio here. © Copyright 2017 - ImageMaker Advertising Inc. All rights reserved.